When we started this section of the site a couple of months ago, we thought we'd just shine the spotlight on our readers' dogs who travel--whether it's in their home state or abroad. Little did we know that we'd be introduced to some seriously amazing canines, some who are professional travelers. Below we introduce you to three dogs who are always ready to roll. What about your dog? Do you travel with your dog? If so, we'd like to meet him or her. Each month, we showcase dogs who travel. Some routinely jet down to Miami for winter weekends, others have done trans-Atlantic crossings. But most of them just like to get in the car and go on family road trips, sniffing around new beaches and trails wherever and whenever they can. 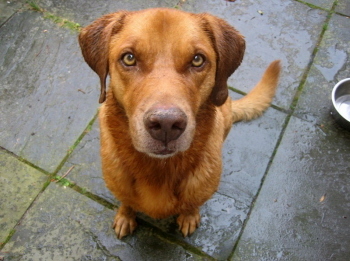 We invite you to share a photo and a bit about your dog and have made it really simple. You can upload a photo and provide details (like those below) here. We'll be in touch with you if we need any additional details and to let you know when your dog will be included. We welcome all dogs who travel including big dogs, little dogs; pure breds and mixed breeds; puppies and dogs of a certain age. 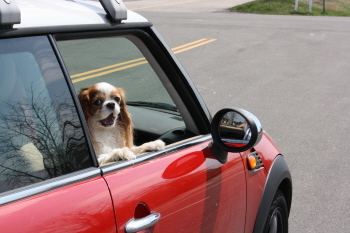 Don't travel with a dog but love taking pictures of those you spot along the way? We also welcome photographs of dogs you see or meet while vacationing. Take a look at this pampered pup to the right. He's really got it made spending his days lounging in thermal baths and soaking up the Siena sun at the Fonteverde Natual Spa Resort in Italy. Wow. Now, let's meet some of the travel professionals! Has traveled to: All over New Mexico, and some of Arizona and Colorado. He will be traveling cross country this summer to be a Dog-Speaker at the national BlogPaws Conference. Favorite destination: Tough call. As New Mexico's Canine Tourism Ambassador, he would have to defer to the entire state. New Mexico's not called the Land of Enchantment for nuttin' after all! And because of New Mexico's dog-friendly environment, Jack has nicknamed it the "Land of Dog-Chantment". A Travel "Tail": As New Mexico's Pet Travel Guru, Traveling Jack is always on the lookout for pet-friendly destinations, activities and venues. It's his #1 job to report on the state's canine travel and he takes his career very seriously. From pet travel tips, dog-fabulous lodging, tasty canine restaurants to unusual things to see and do on the road, New Mexico's Canine Travel Reporter is on the job 24/7/365. When he's not four paws to the road, he's on the settee catching a few zzzzzs. You can learn more about Jack's life at www.travlinjack.com. Favorite destination: As head researcher for New England Dog Travel, Mufasa loves to go anywhere that will have him but his particular favorites are boat rides to Gloucester, MA and visiting Dog Mountain in St. Johnsbury, Vermont. A Travel "Tail": Mufasa and his owner share their travel ideas at New England Dog Travel.com. A Travel "Tail": Lily is a model-in-residence at FarewellTravels.com. In a traveling household, she doesn't have much of a choice. She's expected to go places...and never complains. Do you have a dog who likes to travel? You can easily upload a photo and provide details (like those to the left) here. This Jack Russell--"Biagio"--is really living the life. 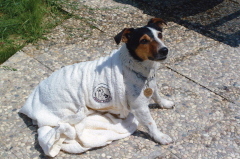 He's reaping the benefits of being the owner's dog at Fonteverde, which is the only thermal baths resort in Italy to host dogs (and cats). The furry guests have a thermal pool of their own which--according to scientic studies--helps animals suffering from arthritis, osteoarthritis and skin problems. What about the robe, you ask? The hotel offers a dog kit with a bath towel, bowl and bag. All that and plenty of green expanses to run around on and dog-sitting services on demand. Want to find out about other dog-friendly places? 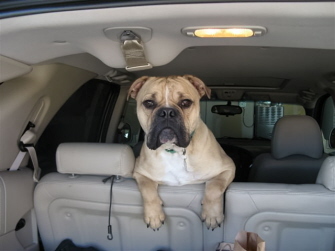 Click below to meet Dozer, The Dog Who Went...Everywhere! Once a month, we post a column about the latest dog-happy place Dozer has traveled to.